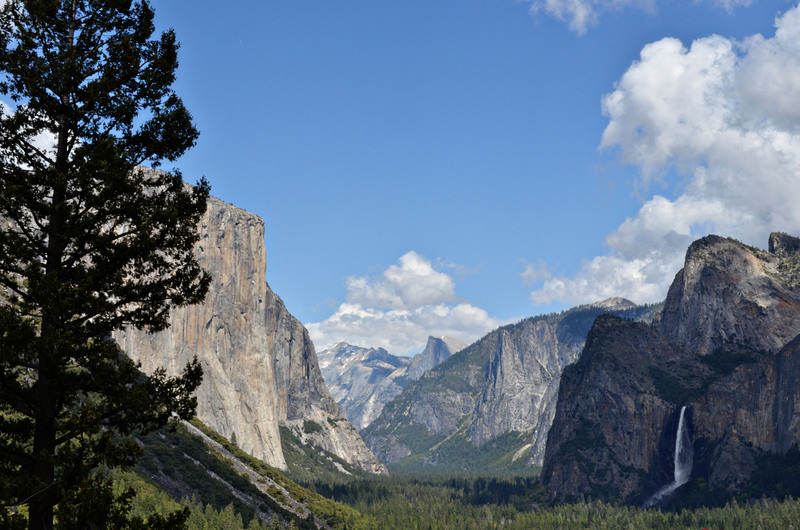 As part of our Spring Break adventures this past week, we spent a day in Yosemite. I’m blessed to have grown up visiting my grandparent’s cabin just outside the part since I was just a few weeks old, but it’s been a long time since I actually went into the park. And while the magnificence of Yosemite is unforgettable, I did forget – or perhaps blocked – memories of how high up this particular vista is. And of the road that takes you through the tunnel and to the giant Sequioa grove. And the winding cliffs alongside it. As overwhelmed as I was by the beauty of the park, I was probably even more overcome by fear and anxiety by those heights. I’ve been fighting fear and anxiety a bit more often lately. We’re coming to the end of a crazy and busy school year…but not really. After realizing how spotty Hanna’s education had been this year, we’ll be doing light homeschooling through the summer. 8th grade honors English hadn’t read a single novel or done much of anything else and social studies – in a year that was supposed to cover American history – was still learning about the Revolution in March when we made the decision to homeschool…when they were learning at all. We’ve got big decisions to make about school next year. If we send her, Hanna will be attending a high school where freshman can no longer get social studies and science their 9th grade year due to budget cuts. I don’t feel qualified – or called – to homeschool for high school, so we’re seriously considering an online virtual school. It has the same WASC accreditation all California high schools do, and offers so many more options. There’s still a lot of prayer and discussion to be had. I’m anxious for summer. I think our warmer weather is here to stay, and I’m working on lists and plans for break. I’ve got a list of closets and rooms to organize, of projects I want to tackle and the pool at my grandparent’s house is calling my name. I see days with work in the morning and lazy afternoons in the future and after this wild school year, I’m looking forward to them. I’m not feeling all that great, the effects of our Spring Break fun. It’s hard enough to keep only to foods that make me feel well when I have total control in my own kitchen…it’s darn near impossible with lots of travel and vacation days. There’s an anxiety that comes with the aches triggered by certain foods – a fear that I’ll slip back to the pain my doctor called fibromyalgia. And yet, I give thanks. I’m thankful we have options for school next year – even if it isn’t perfect. I’m thankful we’ve had this wonderful Spring Break vacation – with trips to the coast and the mountains, which make me even more thankful to live in this beautiful state full of so much of God’s creation. I’m thankful to live near family again, and to enjoy visits from Florida friends. I’m thankful that I’ve had nearly two years to learn what is and isn’t good for my body and wellness, and for the desire I’ve been given to share that.